A history lesson for Jonathan Chait. Jonathan Chait is mad that people call him a “neoliberal” and so insists that the word has no meaning and that it does not describe a real political change that occurred a few decades ago. Many have already explained how silly this feint is, but I would like to add two other points. First, potent words get stretched in popular discourse to the point of incoherence and contradiction all the time. It is one of the great paradoxes of language that words that pique people eventually get annihilated into meaninglessness through overuse. There is nothing special about “neoliberalism” in this regard. The same could be said of words like “intersectionality,” “structural,” “patriarchy,” and dozens of similar words that had fairly clear meanings at one point but that you can also find people using in a lot of different and conflicting ways in the discourse. Second, if we can put aside the word “neoliberal” for a second, Chait’s main claim here is that nothing changed about the Democratic Party and that leftists are lying or delusional when they say it did. What’s weird about this move is that Democrats themselves claimed at the time that they were changing. They even called themselves “New Democrats,” you know like “Neodemocrats,” or maybe even “neoliberals.” Perhaps the self-proclaimed New Democrats, which included Bill Clinton and Al Gore, among others, were lying about changing, but we should at least take seriously the proposition that they were sincere and actually intended, as they claimed, to shift the party toward the center and away from the left. The old ideologies on the right and left are no longer sufficient to realize the aspirations of the American people, and both political parties will be left behind unless they put forth new answers and new institutions for a new era. . . . But in the minds of too many Americans, the Democratic Party has stood for government programs that don’t work, special interests before the interests of ordinary people, and a reluctance to assert American values at home and abroad. The New Deal policies that built and united the middle class no longer command its loyalty. . . .
Our party’s challenge today is to discard the orthodoxies of the past and make government a champion of national purpose and not a captive of narrow interests, a creator of opportunity and not an obstacle to it. Democrats should once again stand for change and innovation, not blind loyalty to programs of the past. Unlike the Republicans, we believe in government and want to make it work in the information age. . . . The new choice we offer is a new public philosophy, not a new set of programs. What does this New Democratic Philosophy consist of? We believe the mission of government is to expand opportunity, not bureaucracy. . . .
We believe the role of government is to guarantee equal opportunity, not mandate equal outcomes. . . .
We believe our society has a moral duty to experiment with fundamentally new approaches to liberate the poor from poverty and dependence by promoting work, family, and independence. America will not succeed in the information age if we continue to waste the potential of millions of disadvantaged citizens. . . .
We believe in reinventing government. We want to eliminate unneeded layers of bureaucracy, and give citizens more choice in public services, from child care and care for the elderly to public schools. And they just keep on going, finishing with a wonderful flourish. Our goal is to make the beliefs, ideas, and governing approach of the new choice the dominant political thinking in America before this decade is out. Just as the New Deal shaped the political order for the industrial age, the new choice can define politics in the information age. Our purpose is not to seek the middle of the road but to build a new road that leads beyond right and left to move America forward. The industrial age is over; the old isms and the old ways don’t work anymore. Today, and in the months to come, we will put forth new answers and a new way of thinking which are based on the principle of inclusion and work for the greatest public good. We invite the American people to join our cause. That is not the approach Democrats have taken in office. 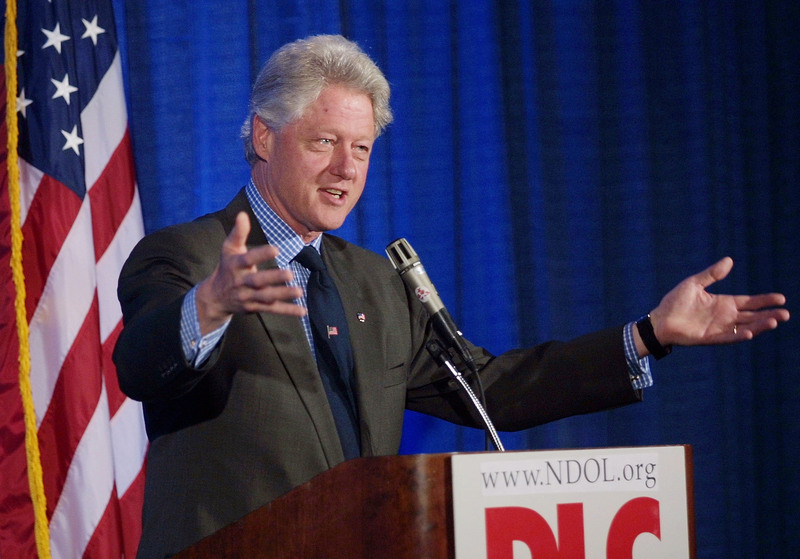 Bill Clinton famously fashioned himself as a “New Democrat,” angering his base on crime and welfare and declaring the era of big government over.